喬治亞好股分享 - 舊討論區 - 巴菲特班 洪瑞泰 (Michael On) - Powered by Discuz! Bank of Georgia (abbreviated as BOG or BoG) is a Georgian bank headquartered in Tbilisi, Georgia. It is the largest bank in Georgia by assets. 99.52% of the share capital of Bank of Georgia is held by BGEO Group PLC, a public limited liability company incorporated in England and Wales with registered number 07811410. 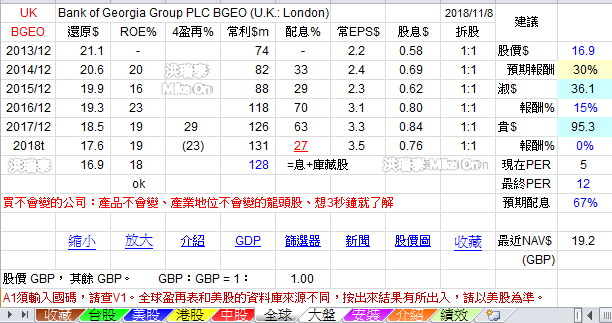 The shares of BGEO were admitted to the premium listing segment of the Official List of the UK Listing Authority and admitted to trading on the London Stock Exchange PLC’s main market for listed securities on 28 February 2012. Bank of Georgia has credit ratings from: S&P: ‘BB -’, Moody's: ‘B1/Ba3’ (foreign and local currency), and Fitch Ratings: ‘BB-’; outlooks are ‘Stable’.